Names I recall (Apologies to all folks I didn't remember yet. There are lots of faces I remember that I can't put names with. Greg Sloat My boss - Electrical Engineer - Deceased. Charles Wray Technician - later became Engineer, now retired. Bill Lapham Electrical Engineer - Lives in Northern California. Added 2008-08-03 I found this clipping from the "DallaSite". 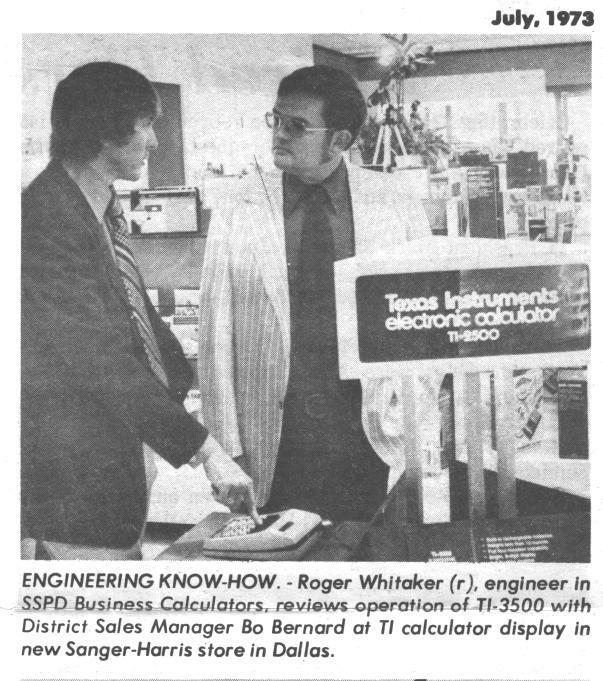 The calculator department, in the early years, were "migrant workers", .Much as I recall most other departments were, too. We developed a theory that there was actually space for one less cost-center than there were cost centers so one whole center had to be in the hallways on carts at all times.. In the fall of 1972 my office space was located in the far South end of the Semiconductor building by the South windows with the door opening right at the end of the East hallway. Later we moved toward the North end of the Semiconductor building on the East side of the building. The scientific calculator folks had been there for some time as were the management and marketing folks. For several months we were in the second floor of the South building at the time that watches were being built there and another few months found us on the Northwest corner of the top floor of the Semiconductor building. We had manufacturing plants in Sherman and Lubbock. SR-60 Processor 2-phase clock circuit, Card Reader, Serial port interface. The TI-150 was the only handheld to use a plasma display. It has a character height of 0.2 inch and was intended as an "Executive" calculator. The case was the TI-2550's. The comments on Joerg's page at http://datamath.org/BASIC/DATAMATH/ti-150.htm are basically correct. It lacked the memory feature and was over priced. The production figure of 4,000 is probably right, although I wonder if they actually sold that many. It definitely was the wrong calculator at the wrong time. The plasma display requires about 150 volts to fire the segments. The TMS0855 is probably similar to the TMS0852 in having relatively high voltage display drive output architecture, but driving the plasma display required use of separate discrete high voltage PNP transistors, 2N5400 or 2N5401's as I recall without opening up my TI-150 to look. My 150 is Serial Number 010038 which was a prototype. Something else that most people may not know is that TI made its own plasma displays at a plant in Sherman. They were a direct replacement for the Borroughs Panaplex. I think that my TI-150 may have one of them. They also made the larger ones for the desktop units, too. My desk on the top floor of the Semiconductor building during the TI-150 design phase. You can see the full set of drawings for the TI-4000/410 hanging on the left. This was the circuit used in several calculators including the TI-500/620 printers and was adapted in some of the later versions of the TI-4000/410 The unique feature a the time was that it operated with input voltages ranging from 100 volts to 310 volts ac 50/60 Hz or even dc. It allowed world wide operation with the only change needed being the appropriate power cord. Datamath little known fact - Prior to the production of the first LED Datamath, an LCD version was prototyped. This was in the very early days of LCD technology and before it was learned that they had to be driven with AC rather than DC. After short periods of use, the prototype LCD's "plated out" making the segments appear on all the time, even when power was turned off. I had one of those crude prototypes, but lost it in a flooded basement around 1979. Pictures from the calculator department.. Polaroid shots..
About the calculators.. Take a look at http://datamath.org I am very familiar with a lot of these calculators as I designed some of them. I have a very rare working TI-150 see http://datamath.org/BASIC/DATAMATH/ti-150.htm It's the only handheld TI ever made with a plasma (neon) display. In the desktops http://datamath.org/Album_Desktop.htm I worked on virtually all the 3000 and 4000 series, but my baby was the TI-450, my first project when I hired in down there. Scrolling on down the page, I did portions of the design for some printing calculators, the TI-500 and the TI-620 and got a patent for an early switching regulator power supply that ran off any AC or DC from 80 to 320 volts without changing any taps, just put the right plug on the cord and plug in. On down the page to the desktop Scientific machines, I designed portions of the SR-60 http://datamath.org/Desktop/sr-60.htm including the card reader electronics, the power supply, display and the internal 2-phase clock for the chip-set. Then on the handheld scientific page the only one I had much to do with was the SR-52 programmable with card reader. http://datamath.org/SCI/WEDGE/sr-52.htm I did the card reader electronics. Later on I found myself in charge of....well, chargers and adapters for all the models worldwide.. One seriously boring job. I bailed out at that point and transferred to the Corporate Research Lab and worked on magnetic bubble memories, mostly for the Air Force. So what happened after that? I answered an e-mail from a kind gentleman asking some questions about my experience with calculators. I replied by assailing the poor fellow with a stream-of-consciousness rambling reply about my life. Those who are brave and have nothing better to do can read that reply here..